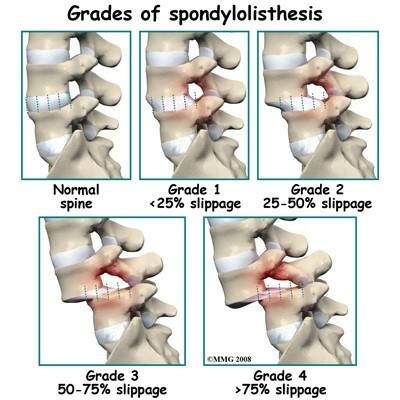 Adult spondylolithesis is most commonly the natural progression of an already diagnosed adolescent spondylolithesis but can be caused by the degenerative change in an undiagnosed adolescent spondylolisthesis. Spondylolisthesis involves an entire disc shifting forward (or sometimes back), very often following the fracture of the pars interarticularis (a fracture in the spine which occurs as a result of repetitive strain). This most frequently occurs in the lumbar spine but can occur anywhere. Whether the spondylolithesis symptoms are new or continuing the best way to treat or manage these stress fractures is still a conservative one. Educating the patient, as well managing activity have the best long term outcomes. Degeneration of the intervertebral disc’s is one of the most common causes of low back pain. Disc degeneration is when the disc starts to wear out due to a worn posterior tether. 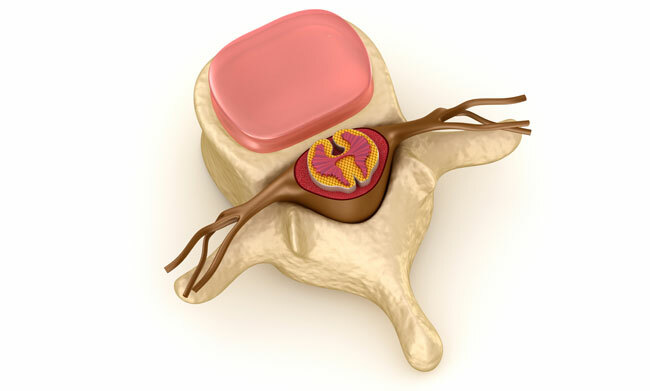 Without a posterior tether connecting the facet joints, the disc space is forced to withstand shear forces (forces it is not designed to withhold). In a healthy spine, the facet joints in the back of the spine protect the disc from shear stress as they act to limit slippage. When there is a pars interarticularis fracture, the facet joints cannot limit slippage. Discs work well as a shock absorber but they are susceptible to being damaged if they have to resist forward or backward slippage. The associated cumulative stress on the disc leads to breakdown and eventually become painful. As the discs break down due to disk slippage, they become flatter and the disc provides less room for the nerve root to exit the spine. In these cases, the patient can develop leg pain (radiculopathy or sciatica). It is common for the leg pain to be noticeable when walking or standing because in these positions the foramen (the opening where the nerve exits the spine) is closed down. When sitting, the foramen is larger and eliminates the pressure on the nerve. However, the converse may also be true. In the sitting position the disc is loaded three times more than when standing, and at times, the loaded disc can bulge into the foramen causing leg pain. All of these issues can be asymptomatic and never cause pain and discomfort, or they can also lead to minor tightening or stiffening. In sever instances, these problems result in chronic pain that leads to a loss of quality of life. Having a spine that suffers spondylolisthesis does not have to drag you down. However, this type of spine does require more awareness and muscular support to get through life. The Ashgrove Spinal Centre recommends regular chiropractic care, education in good posture, as well as core exercises incorporated into you daily life. The Ashgrove Spinal Centre is home to fully qualified and registered health professionals who are highly trained to diagnose and/or treat conditions of the neuromuscular skeletal system.